During the 4th century Saint-Martin, bishop of Tours, developed the vineyard on the bank of the Loire for the benefit of the abbey. Vouvray wines are under the controlled appellation since 1936, it covers 2.000 hectares over eight villages: Chancay, Noizay, Saint-Radegonde, Reugny, Rochecorbon, Vernou sur Brenne, and Vouvray. Winegrowers are allowed to produce 52 hl/ ha for still wines, and 65 hl/ha for sparkling wines. The chenin blanc, or pineau blanc de la Loire, praised by Rabelais in his books, is the only grape variety allowed in the A.C. Vouvray. 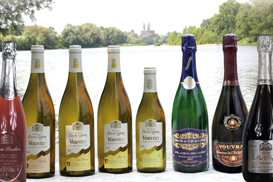 Our Vouvray wines can be sparkling, according to the "méthode traditionnelle" or still, from dry and medium-dry, to moelleux and dessert wines. The aromas of the wines vary greatly and include : flowers, acacia, apple, pear, citrus fruits, exotic fruits, and honey or quince for mature wines. Depending on weather conditions, the wines we produce can be very different and this ensures the richness of our production. After the harvest, the grapes are quickly taken to our underground wine warehouse built in 2008, which is at close proximity to the vines, to avoid oxidation. The pressing is done in a pneumatic press, and the vinification in thermo-regulated stainless steel vats. None of our wines age in barrels. We produce about 120.000 bottles per year, all of which come from our production.